HWPH AG - Historyczne papiery wartościowe - Bank of Canton, Ltd.
Hongkong, 01.02.1937, 75 Shares of Second Preference Stock á $ 10, #1347, 25,3 x 30,2 cm, orange, grau, rotes Siegel, starke Knickfalten mit Einrissen, brüchig, teils alt hinterklebt, Bankgebäude im Unterdruck, Text in Englisch, Name auch in Chinesisch, Rarität! Hongkong, 1 February 1937, 75 Shares of Second Preference Stock á $ 10, #1347, 25.3 x 30.2 cm, orange, grey, red seal, heavy folds with tears, fragile, partially repaired with old tape, bank building in underprint, text in English, name also in Chinese, rarity! Die Bank of Canton wurde 1912 von einigen in den USA lebenden Chinesen gegründet. Es war die erste von Chinesen besessene Bank in Hongkong. Die übrigen Banken in Honkong waren in ausländischem Besitz, vor allem in britischem Besitz. 1921/22 eröffnete die Bank of Canton Niederlassungen in Bangkok und New York. Die Gesellschaft ging 1935 in Insolvenz und wurde 1936 von Dr. T. V. Soong reorganisiert. 1971 erwarb die Securtiy Pacific National Bank 69 Prozent der Anteile der Bank of Canton. 1978 scheiterte der Versuch auch die restlichen Aktien zu erwerben. Zehn Jahre später war die Securtiy Pacific National Bank dann allerdings erfolgreich. Die Bank of Canton wurde in Security Pacific Asian Bank umbenannt. 1992 übernahm die Bank of America die Gesellschaft und benannte sie ein Jahr später in Bank of America (Asia) um. Diese Gesellschaft wurde 2006 schließlich von der China Construction Bank übernommen. 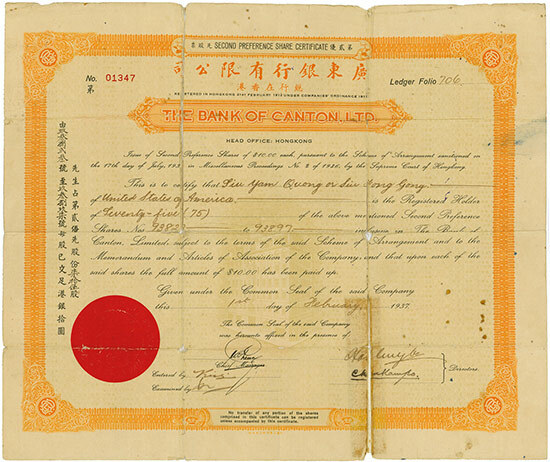 The Bank of Canton was incorporated by several Chinese residents of the US in 1912. It was the first Chinese-owned bank in Hong Kong. At that time, all the other banks in Hong Kong were foreign, primarily British. The Bank of Canton established branches in Bangkok and New York in 1921 and 1922. The company failed in 1935 and was reorganized by Dr. T. V. Soong in 1936. The Security Pacific National Bank bought 69 per cent of the Bank of Canton in 1971. It tried to acquire the remaining shares but talks broke down in 1978. The Security Pacific National Bank completed the acquisition ten years later. It renamed the bank to Security Pacific Asian Bank. The Bank of America acquired the bank in 1992. It renamed it to Bank of America (Asia) in 1993. The China Construction Bank took over the Bank of America (Asia) in 2006.